"Healthcare in Georgia" redirects here. For healthcare in the U.S. state of Georgia, see Georgia (U.S. state) § Health care. Healthcare in Georgia is provided by both the public and private healthcare systems. There is a universal health care system that provides healthcare to about 90% of the population, as well as a system of private medical facilities and private insurance. Georgia became part of the Russian Empire in 1801, remaining as such until a brief period of independence from 1917 to 1921. In 1921, however, it was incorporated into the Union of Soviet Socialist Republics (USSR), where it remained for the following 70 years  From 1921 to 1991, the Georgian health system was part of the Soviet system. The “Basic Law on Health in the USSR and Soviet Republics,” also known as the Semashko model, provided the framework for each Soviet republic and was characterized by almost complete public ownership of healthcare services. Planning, organization, control and allocation of nearly all resources were undertaken in Moscow, while few responsibilities were delegated to the Georgian health authorities. Healthcare was meant to be free at the point of delivery, but illegal out-of-pocket payments to health professionals were also common. Hospitals dominated the delivery system, with high bed numbers and very large numbers of medical personnel. The Soviet system did not encourage economic diversification, leaving Georgia vulnerable after independence in 1991. After the collapse of the Soviet Union, Georgia’s population decreased by nearly a fifth, the economy rapidly moved from a communist regime to a market system, and government corruption and civil wars tore the nation apart. Real per capita public expenditures on healthcare rapidly declined from around US $13.00 in 1990 to less than $1.00 in 1994. The physical condition of facilities severely deteriorated, as did medical technology and equipment. That is why, since independence in 1991, the nation has had to reestablish itself and reform many of its governmental structures, including its health care system. Georgia has made a significant effort to adapt health policy and the health system to the new environment. Mandatory social health insurance was introduced after independence, but was abolished after the 2003-2004 Rose Revolution, which brought about fundamental change in the role of government in providing, financing, and managing public services like healthcare. Now, healthcare and health insurance are privatized. Average life expectancy for Georgians is 74.2, which lies just below the European average of about 75 years. Interestingly, the average life expectancy in former-Soviet Russia lies drastically below Georgia's at about 66 years. The life expectancy in Georgia is 69.3 for males, and 79.0 for females. The total fertility rate is 1.4 children per woman. This is extremely below 2.1, the replacement fertility level needed to maintain current population size. Live birth rate is 12.9 per 1000, and mortality rate is 9.8 per 1000. A large discrepancy exists between rural and urban under-5 mortality rates, with almost twice as many deaths per 1000 live births in rural areas than in urban. The 2010 infant mortality rate was 15.7 per 1000 live births, and the under-5 mortality rate was 17.1. By 2050, the infant mortality rate is expected to drop to 5.6, and the under-5 mortality rate is expected to drop to 6.2. Maternal mortality is 14.3 per 100,000 live births, which is the minimum value achieved from 1990–2008, and there were only 8 cases of maternal deaths in 2008. While still high in international comparison, maternal and infant mortality rates have been steadily decreasing. The leading causes of death in children under 5 can be attributed to prematurity, pneumonia, “other,” birth asphyxia, and congenital abnormalities. Leading causes of death in the population are diseases of the circulatory system, neoplasms, “other,” accidents and injuries, and diseases of respiratory and digestive systems. Infectious diseases are still the source of significant health problems, especially tuberculosis. As in the rest of the former Soviet Union, especially among men, tobacco is a major contribution to the burden of disease; more than half of the population's males are tobacco users. Child immunization rates are surprisingly low and stood between 30-50% in the early 1990s, rising to 70-90% in the early 2000s. Organization of Georgia's Healthcare System in 2000. Source: Gamkrelidze et al. (2002). 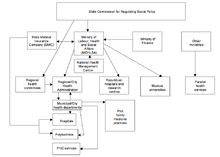 The State Commission for Regulating Social Policy was set up as part of the 2000–2009 Strategic Health Plan of Georgia. It reports directly to the President and provides guidance to the Ministry of Labor, Health, and Social Affairs, the National Health Management Center, regional health departments, and other health-related sectors. In 1999, the Ministry of Health joined with the Ministry of Social Welfare to become the Ministry of Labor, Health, and Social Affairs. It is responsible for the development and implementation of government policy on health care and medical research. In 1995, the Ministry changed its emphasis from tertiary healthcare to support for preventative activities, as well as regulation and accreditation of health services and training. The MoLHSA manages the public health services provided to the poorest population, but the role of government in regulating healthcare and financial transactions has been greatly reduced since 2003. Its approach has been to allow market mechanisms to regulate the relationships between patients, providers, and third-party purchasers. The role of the National Health Management Center is to provide scientific and technical input into the process of health sector reform, and it works directly with both international and local nongovernmental organizations. There are twelve regional health departments, along with twelve Regional Commissions for Regulating Social Processes. In each region, there are also health committees made up of people who represent different sectors that influence health within that region. There are 65 municipalities in Georgia. Each municipality administers a municipal health fund, from which money is channeled to the regional health fund on a per person basis. State Programs in 2000. Source: Gamkrelidze et al. (2002). Georgia entered the 1990s with a wholly tax-funded healthcare system, but reforms in 1995 replaced this system with a social insurance model run through the State Medical Insurance Company. Under the social insurance model, basic healthcare was paid for by the state insurance company, with additional funds coming from Municipal Health Funds and preventative activities provided by the Ministry of Labor, Health, and Social Affairs. A State Health Fund, whose main source of revenue was a mandatory payroll tax placed on both employers and employees, was established to fund the social health insurance model; Municipal Health Funds received revenues from municipal budgets that paid a flat rate for each person living in the municipality. The figure to the right lists the services and programs included in the social insurance model in 2000 and shows which agency administered the program. In 2009, primary healthcare costs were funded by public sources for most of the rural population, and the urban population ages under 6 years of age and over 60 years of age. Public funds from the Ministry of Labor, Health, and Social Affairs now provide vouchers for Georgians who live below the established poverty line to purchase private health insurance policies, and health expenditure as percentage of Georgia’s 2007 GDP was 8.2%. However, all individuals living above the poverty line must pay for private health insurance or services out-of-pocket. Only 18.4% (an extremely low rate compared to other European nations) of health expenditure is from public government sources; 70.9% of total health expenditure is from out-of-pocket payments at the point of delivery. There is an extremely high number of doctors per capita in Georgia compared with other European countries, and it had 462 physicians per every 100,000 people in 2008. There were 320 hospital beds per 100,000 people in 2008. There are three times as many physicians in the nation’s capital city, Tbilisi, than in rural areas. There are low utilization rates of both inpatient and outpatient services, as well as pharmaceutical drugs, suggesting that there are barriers, primarily cost-related, to healthcare access. An estimated 30% of the population is deterred from seeking medical services at all due to the high level of out-of-pocket payments charged. Others delay their visits to healthcare providers. And nearly 22% of individuals with health problems in a 1999 survey did not see a health provider because of an inability to pay. The World Bank identified the illness of a family member as one of the most common sources of poverty in Georgia. In 2000, it was estimated that around 40% of all health spending in Georgia was for only 2.5% of the whole population. Weak government regulation means there is no real way to measure and ensure quality of care. Many facilities are short of very basic equipment, like thermometers and sterilizers. Healthcare system has huge capacity, but low utilization, signaling low productivity. As the referral process has diminished, many patients bypass the primary care level altogether and see specialists directly. Planning for healthcare reform began in 1993 and was led by the Ministry of Health and was undertaken during the post-independence shift towards a market economy. Presidential Decree #400, ratified in 1994, provided the basis for the reorganization by expanding healthcare funding sources from government revenues only to include elements of government, payroll tax, and municipal subsidies. The first major changes took place as a result of the 1995 Georgian Health Care Reform Package that introduced new concepts, including social insurance, official user fees, and new provider payment mechanisms like co-payments. In 1999, the Georgian National Health Policy, which outlined objectives to improve the equity, accessibility, and affordability of health services, was developed. 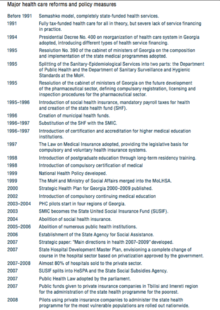 The Strategic Health Plan for Georgia 2000-2009, which detailed more strategies for implementing the National Health Policy, was then published. Development of the Primary Health Care Master Plan began in 2003 with support from international aid sources. A plan was outlined to consolidate the 750 existing primary health care facilities outside of Tbilisi into 549 facilities that would serve approximately 30,000 people each. The government was not equipped to regulate such a large number of private practices, though, and the plan was reevaluated in 2007. The consolidated facilities were deemed unrealistic for the mountainous regions of the country and unnecessary in urban areas, and the plan was altered to allow about 900 primary health care facilities in rural areas and an unlimited number in the largest cities. In 2008, the Ministry of Labor, Health, and Social Affairs distributed primary health care "toolkits," which included renovation plans and funds, to rural providers in about 900 rural villages. The government that came to power after the Rose Revolution was faced with addressing problems that had surfaced during the weak implementation of previous reforms, especially a rise in out-of-pocket payments, an excessive and obsolete health infrastructure, and unequal access to healthcare services. From 2004 to 2006, a major emphasis was placed on transforming the social sector. Previous forms of social assistance created for specific groups were replaced by a new targeted social assistance program, which defined beneficiaries by socioeconomic status, identifying those most in need of economic assistance. In 2006, the State Agency for Social Assistance was created, along with the Governmental Commission for Health and Social Reforms, which was to become the decision-making body for healthcare reforms. 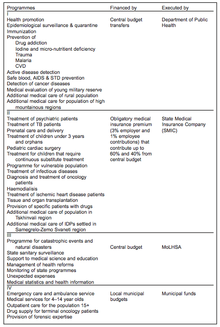 The first policy created, entitled Main Directions in Health 2007-2009, outlined four main health objectives for the government to address: affordability of basic health services and protection of the public from serious financial health risks, quality of services, accessibility of services by continued development of infrastructure, and efficiency of the health system. The first reform to be implemented as part of the Main Directions in Health was the Hospital Development Master Plan. Begun in January 2007, the reform resulted in the replacement of the existing hospital infrastructure by transferring ownership rights from the state to the private sector. Hospital locations were chosen based on the principle of 45-minute geographic accessibility, with number of beds based on population size and health needs. Newly reformed hospitals integrated psychology, necrology, oncology, obstetrics, gynecology, pediatrics, and infectious diseases meant to provide comprehensive quality healthcare. 1 2 3 4 5 6 7 8 9 10 11 12 13 14 15 16 17 18 19 20 21 Gamkrelidze et al. 2002. "Health Care Systems in Transition: Georgia." European Observatory on Health Care Systems. Vol. 4, No. 2. ↑ Gotsadze, T. and E. Schouten. 1997. Healthcare Reforms in Georgia: An analytical overview. UNICEF & Health Net International: Tbilisi. 1 2 3 4 5 6 7 8 9 10 11 12 13 14 15 16 Chanturidze, et al. 2009. “Georgia: Health system review.” Health Systems in Transition. 1 2 World Health Organization. 2007. Country Cooperation Strategy at a Glance. 1 2 UNDP. 2000. Human Development Report Georgia 2000. United Nations Development Programme: Tbilisi. ↑ UNDP. 1999. Human Development Report: Georgia. United Nations Development Programme: Tbilisi. 1 2 World Bank. 1999. Georgia: Poverty and Income Distribution. Volume 1: main report.